This buffalo seitan recipe is a house favorite! I adapted it from a Vegetarian Times recipe for seitan hot wings. I love and missed buffalo chicken sandwiches, so the quest for the ultimate buffalo seitan recipe began. I tried awhile back with buffalo tempeh, which I considered a success, but I’ve found that seitan is a much better substitute for wings than tempeh. There are a lot of steps in this buffalo seitan recipe, but it looks a lot worse than it is, and it’s totally worth the effort. I make this buffalo seitan recipe at least every other week. In a medium size bowl, stir together the vital wheat gluten, 2 T flour, 1/4 t garlic powder, 1/4 t onion powder, marjoram, and pepper. Stir together the soy sauce 3/4 cup of the broth, then add it to the other ingredients and stir it until soft dough forms. This will happen quickly; you might need to add another tablespoon or so of water in order to incorporate all of the flour. Transfer the dough to flour-dusted work surface, dust the top with flour, and roll it out into rectangle, approx. 9″ x 14″. Cut rectangle in half lengthwise, then cut each piece into whatever size cutlets suit your bread, I go for chicken breast size. Keep in mind that they will expand when you boil them, but it’s not a big deal to cut them into smaller pieces after you cook them. In a large pot, bring the remaining 4 cups of broth, 1 t garlic powder, 1 t onion powder, and 1 t sambal oelek to a boil. Add seitan pieces, bring it back to a boil, then reduce the heat, cover, and simmer it for 30 minutes. Drain the seitan and let it cool. I transfer it to a cutting board, flipping it a few times as it cools, otherwise it’s a bit slimy. Combine the sambel oelek, butter, and vinegar in a small saucepan. Stir it over medium heat until the butter melts and a sauce forms, then set it aside. Mix together 1 t of the buffalo sauce with 1 T of oil in large bowl. Add the seitan, and toss it until it’s well coated. Sprinkle it with the remaining 1/2 cup flour, and toss it until it’s well coated with flour. Arrange the seitan in single layer on greased baking sheet and broil it for 8 to 10 minutes, or until it starts to brown and the edges start to crisp, then flip it and repeat. Transfer the seitan to a large bowl, add the sauce and toss until it’s well coated. Whisk together everything except the bleu cheese, then stir in the bleu cheese, and refrigerate for at least a couple of hours so the flavors have a chance to mingle. 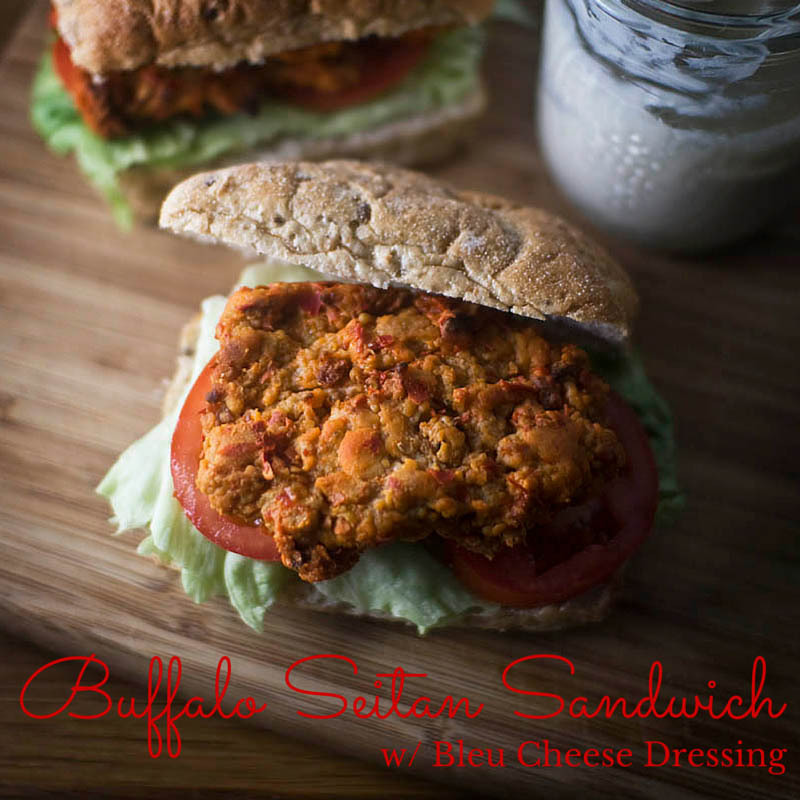 Toast your favorite type of buffalo seitan sandwich bread (I’m partial to rolls and baguettes), then spread both slices with the bleu cheese dressing, layer with lettuce and tomato, then top it with a piece of buffalo seitan, and perhaps a bit more dressing. I’m off to London in the morning, and won’t be back until mid-week. That means no Travel Tuesday, but I’ll be posting on Facebook and Instagram, so if you’re not following me there, now would be a good time :) See you next week! Ok, to be honest I have never even heard of Seitan! So I googled it ;). I am intrigued! I LOVE buffalo anything! 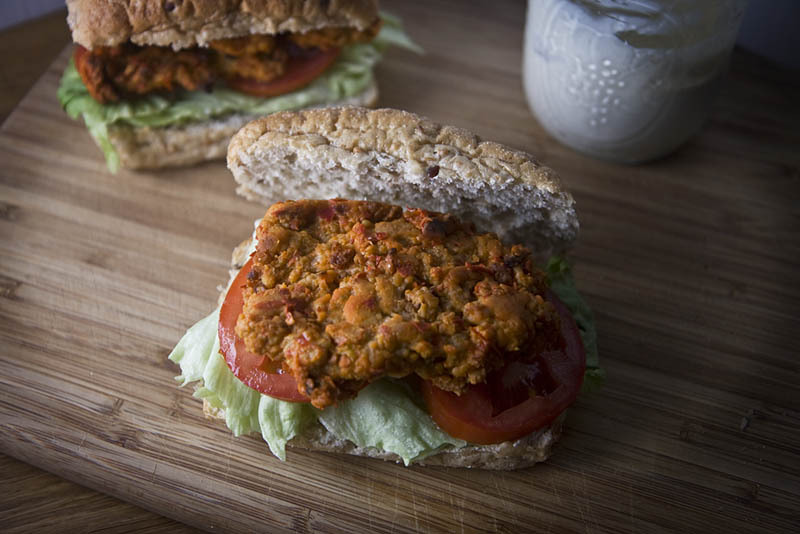 This recipe definately makes my mouth water while looking it over, so off to my local health food store to try and find the ingredients and give Seitan a try! Thank you for the fabulous recipe! I had never heard of Seitan either but it looks very interesting! I rarely get an opportunity to try new recipes but feel inspired by your post to give it a try! Thank you for sharing this wonderful recipe! The sambel oelek definitely adds kick, but the bleu cheese cools it down! It adds a more complex hotness than say Frank’s sauce… I buy mine at an asian grocery store. This sounds like an amazing homemade bleu cheese dressing!! My husband loves buffalo and chicken so this would be amazing for him. I love making salad dressings, it always seems to taste so much better then store bought. Yes! I couldn’t find bottled bleu cheese dressing in Denmark, which is why I made my own, and I couldn’t believe the difference. I don’t know how I survived so long with bottled bleu cheese dressing! I also never heard of seitan. Wings are a big hit in my house so I definitely want to try this recipe. I never though of making my own blue cheese. I bet it was delicious! We are big fans of the buffalo flavoring, so I would miss it as well. I have never heard of seitan, but it seems like a key ingredient in not just this, but other like recipes. I would love to try this vegetarian version of a favorite sandwich. I have never heard of Seitan so I googled it. What an delicious sounding recipe and I love the ingredients in the blue cheese. The flavour combinations of the creme fraiche, mayo and blue cheese sound delicious. This looks like something I would order in a restaurant when I feel like indulging with food that will be worth the calories! This one is definitely worth the calories! You’re welcome… I hope you enjoy it as much as I do! I’ve never tried Seitan! This looks delicious! Thanks for sharing it with the Say G’day party! Pinned and hope to see you on Saturday! Looks yummy! 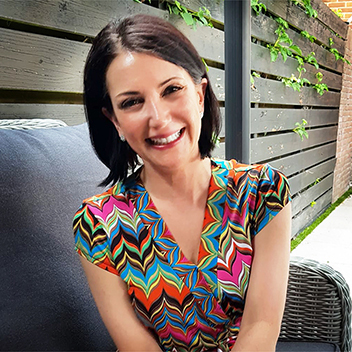 Thanks so much for sharing with us at Bloggers Brags. I’ve pinned this to our board on Pinterest. Have a great weekend!